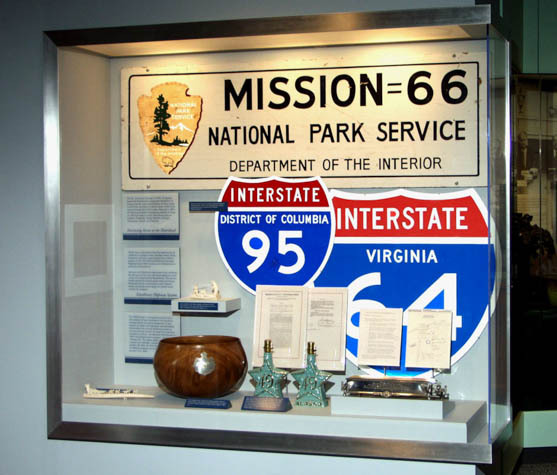 Although travel is all about getting off the beaten path and seeing out of the way places, getting from one place to another by automobile became a lot easier 60 years ago this year when President Dwight Eisenhower signed the Interstate Highway Act of 1956. Love ‘em or hate ‘em, interstates changed the way we travel in this country. Until that time, roadways in the U.S. were a mishmash of construction techniques and materials, a crazy collection of names and signs, roadways that would cross one state only to stop at the state line and bottleneck around an urban area. There was no consistent funding method or means of oversight. Dwight Eisenhower recognized the mess not only as a hindrance to economic growth in this country, but also a national security risk. During his service in WWII, he was impressed with Germany’s comprehensive road system that allowed the military to move unencumbered about the country. The Cold War and its threat of nuclear war was reason enough for a good set of roadways to be built in the United States to quickly evacuate major cities in case of attack. The Interstate Highway Act did something that no transportation law had yet done – it created a source of funding by adding a federal tax to gasoline sales. Eisenhower signed the law on June 29, 1956. We now have nearly 47,000 miles of interstate in this country. Several places claim the "first section of highway," but it leaves a lot open for interpretation. Long before the Interstate Highway Act, the Pennsylvania Turnpike included 160 paved miles of I-70 and I-76 that remain today. Missouri was the first state to award construction contracts under the new law for what are now parts of I-70 near St. Louis and I-44 that replaced Route 66. But because President Eisenhower was from the great state of Kansas, let’s give props to an eight mile stretch of I-70 between Topeka and the president’s home town of Abilene as the first completed paved stretch of interstate under the law. Sure, preliminary construction started much earlier, but it was open for business by November 1956. A historical sign at mile markers 342 and 350 celebrates this designation. When the entire 424-mile stretch of I-70 in Kansas was finished in June 1970, it was the longest continuous segment of Interstate highway to be completed by any state. Missouri, Kansas and Pennsylvania were leaders in the initiative. The Dwight D. Eisenhower Presidential Library and Museum in Abilene, mile marker 275, includes a nice exhibit on the Interstate Highway project, although it is a little overwhelmed by the extensive presentation on Ike’s role as the Supreme Allied Commander during WWII. The library includes hundreds of documents on the project, one that Eisenhower considered one of the greatest contributions of his presidency. I-405 around Los Angeles is considered one of the country’s busiest interstates with more than 375,000 vehicles per day. The longest interstate is I-90 with 3,021 paved miles between Boston and Seattle. President Eisenhower is honored with a tunnel in his name through the Colorado Rockies on the Continental Divide at 11,158 feet above sea level, the highest stretch of interstate in the country. There are more than 250 state operated rest areas along the federal highway system. The average American drives almost 14,000 miles a year, according to the Federal Highway Administration. Having comprehensive travel insurance when traveling America’s interstate highway system just makes good sense so be sure to find the right policy for you! A Midwest farm girl at heart, Diana Lambdin Meyer caught the roaming bug early in life. Diana married well - to a photographer who also has the travel bug and whose work in still and video complements her words. Now based in the Kansas City area, Diana is a member of the Society of American Travel Writers who makes a full-time living on the road and at the keyboard. Read about Diana's adventures on her blog, Mojotraveler or follow her on Twitter or Google Plus.